When Ladies Meet (1941) is one of MGM's megastar dramas, featuring four brand-name stars, lush production values and a screenplay drawn from a high-profile property. For all that, it's a pretty weak film. The script is based on a Rachel Crother's play about a popular novelist struggling to finish her latest book whose protagonist is a woman having an affair with a married man. In "real life," the author (Joan Crawford) is having an affair with her married publisher (Herbert Marshall). Her boyfriend (Robert Taylor) hopes to break them up by inviting the publisher's wife (Greer Garson) to country week-end with all the interested parties. It's a cracking great set-up for either melodrama or comedy. The script is intelligently written, the characters are interesting and the dialogue strikes a nice balance between wisecracks and wisdom. I can't remember ever watching a movie with a script this good, that I liked this little. Why don't I love this movie? The problem is the married man. For certain of my favorite movie stars, I have cut-off years. Laurence Olivier is 1960. Michael Redgrave is 1950. And Herbert Marshall is 1940. I know that these actors probably did some fine work after these dates, but I've just never been interested in it. And, to make matters worse, I've so often been disappointed by by their post-cut-off work, that my prejudice has tended to reinforce itself. When Ladies Meet is a rather drastic example of this. The whole thing hinges on Marshall and Crawford's affair, which must be made convincing--but not too attractive because of the production code. This balancing act is rather tricky. As much as I love Herbert Marshall,I don't find him at all appealing here. He just seems too phony and not in the wonderfully cynical way he is in Trouble in Paradise, where the audience is in on the joke. In When Ladies Meet, he has lied to himself as well, and believes that his love for the author is a grand passion that must not be denied. Had Marshall made this movie a decade earlier, when his character could have been given free reign to willingly lead the author to her doom, we might have had something. We might have had Trouble in Paradise Part II, the Love Quadrangle. Instead, what we find out, of course, is that this isn't his first such grand passion and when confronted by his wife, he instantly gives up on his lover. The affair reminds me of the one between Diane Keaton and Michael Murphy in Woody Allen's Manhattan. "The probably sit around on the floor with wine and cheese and mispronounce 'allegorical' and 'didacticism'." It's hard to believe that Joan Crawford would ignore Robert Taylor to have an affair with this man or that Greer Garson would stick by him. Not to mention the fact that you find yourself wondering why a man who is married to a woman fifteen years his junior who looks like Greer Garson is philandering to begin with? And that's just the start of this film's casting troubles. Garson plays the older, wiser, married woman, and Crawford the young, single profession who is dealing with the realities of love for the first time. Robert Taylor refers to Crawford as a "gal," and the whole point of the script is that she's rationalized herself into a big mistake. Garson was only a year older than Crawford, but she seems much younger--perhaps because she'd only been acting in film a few years while Crawford had been a familiar face for well over a decade. In any case, Crawford comes off as far too worldly to fall for Marshall's malarky. If these two actresses had to star, it would have made more sense to reverse their roles. Garson has really good chemistry with Taylor, as well, making it even more puzzling that he doesn't go for her instead. Taylor is great fun here, getting all the good lines and some physical comedy. 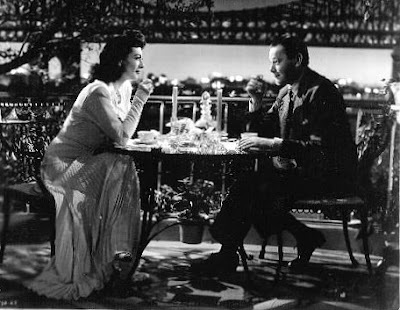 In one memorable scene Garson takes him out on her tiny sailboat, and he pretends to know what he's doing while feeling desperately ill and scared. Spring Byington and Rafael Storm nicely round out the cast, playing the third couple at the unhappy country week-end, so wrapped-up in their perpetual redecorating that they scarcely notice the melodrama unfolding around them. I look forward to watching the pre-code version of this film with Ann Harding as the wife, Myrna Loy as the mistress, Robert Montgomery as the boyfriend and Frank Morgan as the two-timing publisher. Replace Morgan with Marshall would be Fantasy Football casting.